Those of you in the UK are in for a treat! For the first time ever, RiffTrax: Live is broadcasting live from the Prince Charles Cinema in London on February 15. And you don’t get just one movie – you get two: Plan 9 From Outer Space and Samurai Cop. It’s one night only, so don’t miss it. If you’re not in the UK but you’re up for some winter fun, check out Jack Frost. Yes, the snowman looks that bad, but fortunately the RiffTrax guys make it hilariously watchable. Many of you remember that RiffTrax: Live tackled that horrible cult favorite, The Room, a few years ago. 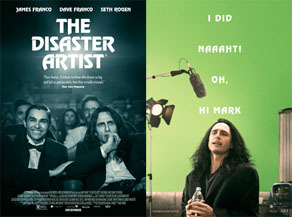 Well, now you can also see The Disaster Artist, a film based on director/writer/lead actor Tommy Wiseau’s journey to bring that movie to life. Strange how it has a cult following now, but I’m sure RiffTrax has helped the film along. The Disaster Artist is supposed to be excellent, so catch it in theaters or when it hits DVD. Directed by Guy Ritchie, it’s a reimagining of the King Arthur legend. This film caught my interest last summer. I was never a fan of Guy Ritchie until the Sherlock Holmes movies, but his quirky style is quite original. When the movie was panned by critics, I skipped it. Bummer I did, because I enjoyed it. The opening scene with the giant elephants as big as a castle attacking is ambitious and breathtaking. There are a lot of incredible scenes, as well as simple, smaller ones, that are simply captivating. The actors do a fine job. Jude Law’s character oozes coldness and Charlie Hunnam is a solid young Arthur. (If not just a little bit like Thor.) The vast array of supporting characters are all very real and provide a lot of color. Richie’s unique style is very much in evidence here, and just like the scenes in Sherlock Holmes where he solves the crime in slow-motion flashbacks, Arthur describes scenes both past and present with the same flare and humor. This is a reimagining, so while there is a Lady of the Lake, don’t expect Sir Lancelot. And similar to A Knight’s Tale, there is a blend of modern elements in this medieval tale. Bottom line – if you enjoyed the Sherlock Holmes movies, like Guy Ritchie’s directorial style, or enjoy something quirky, then you’ll enjoy this film. It’s not for everybody, but I found myself fascinated by this slightly messy but ambitious and fun film. Also released last summer, this is the fifth film in the franchise. 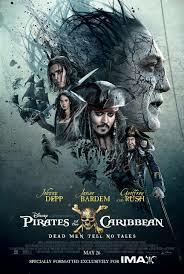 A ship of dead pirate killers escapes the confines of the Bermuda Triangle and come after Jack Sparrow. Will Turner’s son Henry, a mysterious woman named Carina, and Captain Barbossa also want to find Sparrow – and ultimately find the Trident of Poseidon. Kudos to Disney for taking an average ride at Disneyland and turning it into a five billion dollar franchise. These films keep making money, Disney will keep making movies. The multiple set pieces are top notch and massive. No special effects budget was spared. Overall, the film is good with lots of funny moments, but it’s nothing you haven’t seen before. Many times. Worth a rental if you’re bored. Last week, I listed a combination of best films/personal favorites of 2017. Someone asked what were the biggest disappointments. Below in descending order are my picks. 7 – John Wick: Chapter II – While the movie was good and most people thought it great, I grew bored with the repeated scenes of Wick shooting someone. He must’ve shot five hundred people in the head and they showed every single one of them. We get it – he’s a badass with a gun! Enough already. 6 – Get Out – Everyone raved about this horror film, and while it was very well done and finely acted, it wasn’t anything new. The idea of someone’s soul occupying another person’s body had been done countless times and this film was just more of the same. 5 – A Cure for Wellness – This film was just a bit too weird and too many things didn’t make sense that were supposed to make sense. I also don’t like the lead actor, so it made it difficult to connect with this overlong, convoluted film. 4 – Kong: Skull Island – While the set pieces and special effects were amazing and it boasted some top notch actors, the story was disjointed and just never came together. Samuel L. Jackson was wasted as a one dimensional villain. 3 – Alien: Covenant – Every horror film cliché known to man is used in this film. It’s disjointed, the characters aren’t very likeable and rather dumb, and it’s full of plot contrivances and situations that run against the logic of Aliens. 2 – Life – Speaking of Aliens, this film was nothing but an Alien rip-off. Well done, but right off the bat a lot of bad decisions by the crew (more horror clichés) ruined any chance this film had of being decent. Very annoying. This film was highly overrated. 1 – Valerian and the City of a Thousand Planets – And the winner for biggest disappointment by a landslide! This had to be the biggest, most convoluted mess I’ve seen in years. The director tried to cram every element of the comics into one film and it’s a complete disaster. Plus the two leads are horribly miscast and have zero chemistry. Not only was this the biggest disappointment, it’s also the worst film of 2017. And there you have it! What films disappointed you last year? Another successful IWSG post day! And so many who were grateful for the timing of the monthly question. Looks like some great plans made by many. Plus special thanks to Olga Godim for her post of gratitude. That’s why this group exists! Have you ever checked your overall book or author ranking at Amazon? I never knew there was a thing until this past week. Sadly, this feature only goes back to February 2013 for the book rankings and September 2012 for the author rankings, so it completely misses the nine months my first couple books were in the top ten of science fiction on Amazon and Amazon UK. But the results were still interesting. My highest author ranking was 647 in September 2012. Have you ever checked your rankings? Ready for some RiffTrax or Disaster Artist? Have you seen King Arthur or the fifth Pirates film? Ready for #IWSGPit? Ever checked your overall Amazon rankings? 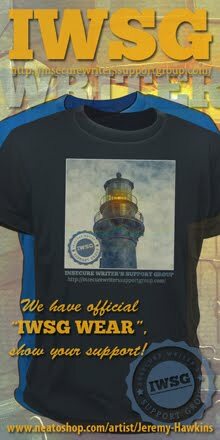 Enjoy the IWSG postings? And what was the most disappointing film you saw last year? Wow, this is unusual, I am near the top of your comments. I am pleased to report I haven't seen any of your disappointing films but will see Jack Frost. As for London, I am as far as way as possible, it is 24 hours of airtime. My husband rented "Valerian and the City of a Thousand Planets" and couldn't persuade my son to watch it with him. :) Maybe they'll watch the Pirates movie, since they've seen the rest of them. I try not to pay too much attention to my rankings unless I'm running a promotion. It's exciting to see one of my works featured on a list, but I know rank drops quickly after the promotion. Glad you liked the King Arthur movie because I like that story. Good to know the movies to avoid. I don't see that many so need to pick only the good ones. I did watch Pirates and to me it was a typical Pirate movie. Valerian was definitely a disappointment. I thought it started out good, but then as you said too much was going on. It needed the chemistry factor to make it more believable. Thanks for the shout out! My first time being published. Elizabeth, your son made a wise choice. Pat, I didn't mind the fourth Pirates, but I really didn't like the second and third. Sandra, very true. That's why these lifetime rankings were interesting to look at. Natalie, it's a really interesting take on the legend. I liked Get Out, but didn't love it. I didn't care for Skull Island at all, and I'm glad I didn't go see it in the theater. Those sound like good rankings to me! Those author rankings can be depressing. But I did check and the highest I ever reached was 628 (for romance) back in June 2015. Don't know what I did then, but apparently it was something to be noticed! Valerian was awful. I liked the last Pirates movie though. It made me laugh. I've never checked my overall rankings on Amazon. I have enough trouble figuring out the sales rank fluctuations. You know, with regards to Covenant and Life, it's really kind of ironic. A lot of the movies are trying to recapture the wonder of the originals but it all boils down to bad writing. In the original movies, the issues stemmed from the fact that, despite their best efforts and best decisions, that crew was still killed. They weren't dumb and the only really 'dumb' decisions were deliberate sabotage. But, because writing a script like that requires more than two brain cells, the scripts are always about fantastically idiotic meat puppets with no establishment, no characterization, and the problem solving skills of a drunk four year old. I did see Kong and John Wick, and found them amusing enough to be worth the ticket, even if I wouldn't recommend then to anyone else. Netflix just came out with the last Pirates movie and I can't say it kept me enthralled. Mostly I was playing Aralon on my kindle during some of the battle scenes. I'm glad I saw it but really think they made two Pirates movies too many. Sorry I missed IWSG last week, I think it sneaked up on me when I wasn't looking! I have been trying to finish a first draft so I guess I can blame that! Agreed on Valerian. Ugh. I loved the King Arthur movie though. The story telling conventions they used to feed you a ton of backstory in a short time... Awesome. Kind of sad we won't be seeing more of that movie series. Thankfully I've not seen one of those bad movies! Though I'd been tempted by Valerian because the trailer looked so pretty. I just checked my author ratings. Yikes! I looked at each book too, and it's interesting to see the patterns. Have a great week! Your Star Wars opinion about preferring non-Lucas Star Wars movies is equivalent to mine preferring non-Roddenberry Star Trek anything. The most disappointing movie to me was The Dark Tower. I love the book series, love both lead actors...what could go wrong?? Apparently the answer is everything! LOL what a mess. I'm curious about the King Arthur movie. I liked Charlie Hunnam on Sons of Anarchy. Hi, Alex! Thanks for featuring Olga's post on the IWSG. I'd missed it on IWSG Day, and I'm glad to have read it. She did a great job of articulating what so many of us feel. I missed all the movies you featured. I'm on the move so much, I miss a lot of movies ~ no loss in these cases. Congrats to Truedessa for being published in "Chiaroscuro." Wishing you a great week. I didn't watch enough movies to have a bad pick, but I have heard bad things about the ones you mentioned. I sometimes check my rankings if I'm running a promotion or are just releasing a book. Otherwise, I don't bother. I might watch Arthur, as it looks pretty good, and maybe Pirates if I get around to it. I rarely check my Amazon rankings anymore, since it's so depressing to see that flat line month after month, for well over a year. Congrats to you - you've marketed and stayed forward thinking. I have not and am very aware of that. The rest of your post is spot on for reviews. I saw it in 2017, but it was end of 2016 - Passengers with J-Law and Chris Pratt. It had its moments, but I expected better. And this summer I knew Baywatch would be cheesy, but I expected maybe a teensy bit more. Shame on me. Crystal, sad it didn't make enough money to warrant more. Tammy, kids aren't as particular. Julie, I still want to see just how bad The Dark Tower was. Fundy, her post was really touching. I haven't seen the most recent Jack Sparrow adventure, but I did get a kick out of the others. I'm gearing up for the #IWSGPit. I think it's going to be even bigger than the first one. I can't think of a movie that I didn't like, but I'm sure there's one. If they're violent I turn on the computer. My sons always know when I don't like what's on because the laptop is on. But I can't think of a title. I check the stats once in awhile. As always lots of information, Alex. True is an amazing poet. I'm glad to hear she is in the Chiaroscuro anthology. Did you stay warm this weekend? Greenville/Winterville's side roads were awful. Statesville had no snow...thank goodness. Samantha, yes it did. And now that you mention it, the film was a bit grey. Lee, considering how many agents and publishers I've contacted, it will! Sandra, it was really damn cold this weekend! I've definitely checked my rankings on Amazon. Sometimes I can get victimized by checking rankings and sales too often, but it's something I have to keep an eye on, for sure. I was surprised to see "Get Out" on your worst film list, but you're right that the underlying idea wasn't original. It was just the message it tried to convey and the way it was told that made it different. King Arthur sounds catchy enough with an interesting plot. Thanks for the heads up on the blooper movies, Alex. Getting a high ranking on Amazon, now thats dedication. conversely, I just hope folks can find me under Star Trek Blog. I wonder if The Disaster Artist can truly capture what The Room is. Disaster is certainly an appropriate word. Get Out was disappointing? Afraid I'm going to have to disagree with you there. I haven't checked out my overall author ranking in a long time. Might do that. The only one of the disappointing films I've seen is the King Kong one. It was pretty bad. I knew when I saw the Valerian preview it didn't look good. I'll take a chance on the Arthur movie since I'm bored with everything on TV. I haven't seen any of those films. I don't go to the movies much, and I only go if it's something I really want to see. (I can't knit in a movie theater, so it's going to be something where I don't need my physical white noise.) So, no disappointing movies. Still haven't seen any Riff Trax - but they sound hilarious!! Being restricted by my wheelchair, I have managed to avoid the disappointing films (as well as almost all your best films/favourites). 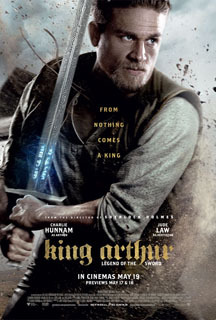 As an Arthurian devotee - from books to films - I will have to rent King Arthur: Legend of the Sword. My top films of 2017 would be Wonder Woman and Rogue One - even though I've seen some negative comments about both. Disappointing might be more the last film the great-grand-kids wanted to rent and I spent $6.99 on - The LEGO Ninjago Movie - because the kids got bored so never finished it. But that's kids. I think I'll join the twitter pitch party. Will check the post about it. Keep it going. You're blogland's best. JH, it was a good film. I just couldn't get past the 'seen-it' factor. Teresa, go ahead and laugh! JE, sorry, it just didn't do it for me. Susan, it will be different, I guarantee it! Roland, both excellent films. And sorry you wasted money on that Lego movie. I've never checked my rankings on Amazon. Would probably be embarrassed. Have not seen any of these movies but I have heard enough bad things about your top three picks that I 100% believe what you say about them. Congrats on your Amazon ranking Alex. 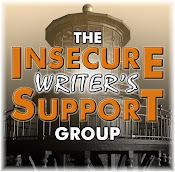 Thanks for stopping by my blog and Happy IWSG 2018. Ahhhh huh, I see you got a "YOU ROCK" Award! Well, I can see why! So were your ears ringing today? Yep, I was talkin' about ya. I met this gentleman at Walmart (he works there) & he was saying he writes books & he gave me his card and I told him I'd turn him on to you. I'm going to give him your email address, but first I'm asking you first if that's alright and you blog website. Let me know if this is okay or what you would rather. THANKS MY FRIEND... big hugs. The Snowman sounds hilarious! Much like something my sons would watch and narrate. They're our household's personal RiffTrax. Glad to hear a recommendation on King Arthur . . . sounds like something that would interest me for sure. And as much as I thanked you for the last post's best movies, thanks for the heads-up warning on the worst ones. I can safely not waste my time. Jack Frost sounds great! As does King Arthur (in a different sense, obviously) Can't wait to see all those pitches. Welcome Riff Trax to the UK, I live about 2 hrs awat by train. Great news and revciewa Alex. Have a good week. Hey, Alex. I hope you have a fabulous 2018. Thank you for all your support. I think I enjoyed all the movies I saw last year. I didn't rally see many though. I will definitely check out the latest Pirates one day. Probably just rent it. I like the series, but not enough to want to buy it for my collection. Hey Dolly! That's fine. Direct him to the IWSG site. That would be even better if he's looking for information. Another twitter pitch party...What a great idea. PS We hit 4 this weekend and Greenville -2. I haven't seen any of those movies on your bad list, yet. But probably won't, either. Maybe the Alien one if it goes on streaming. PS: I had air fry potatoes for breakfast again. Shocking, I know. So flippin' yum. No oil. No preheat. No problem. 'Pirates' had been a good movie before. It is good to see this remake for an opinion. Rankings will not feature too much in making choices. It is what interests one is the pull factor! A few months back I rented King Author the Legend on Demand. I loved it so much I watched it two nights in a row. I like Keanu Reeves but I didn't care for the John Wick movie, so I never rented the second one. And with all the Pirates movies, the first one is the best. I hope I get bonus points for like commenting at nearly four in the morning. That's quite the movie list and as always, an in-depth analysis by your good self. Thank you for that. Nice to see mention of my nice, poetic friend, Truedessa. I shall put out the word to Penny the Jack Russell dog and modest internet superstar to to make her presence known on the IWSG Twitter Pitch Party! Nope, not seen King Arthur, although his cousin was seen drinking in one of the local pubs. I've watched quite a few Rifftrax movies on the Pluto TV app on my Roku and on Amazon Prime. Maybe they'll add the London ones at some point, though I've seen both of those in the regular Rifftrax versions. I didn't manage to see King Arthur - I'm rather a fan of the character, so that's something that needs correction, though this sounds like it's definitely a film for big screen viewing, will have to wait till it's in theatres again. I've avoided all the disappointing films too. Congrats to Truedessa! Always a little extra-nice to see a poet/ more poetry published. Best wishes to her and to all at dVerse. Sandra, that's cold. We were close to zero. Ivy, glad you are enjoying yours! We are still working on the perfect onion rings. Cathrina, it's a fun film, isn't it? Gary, yes you do! And thank Penny for spreading the word. Little over a week to go! I might see the King Author movie. I haven't seen most your thumbs down movies listed, but I did see John Wick II. I agree, it was disappointing. I did like the first one though. Well, Jack Frost certainly sounds entertaining in a perverted sort of way. Grin. Agree with Lyn on Blade Runner. Though, I think it's got a lot of guy appeal. I enjoyed King Arthur too. I gathered from the previews that it wasn't going to stick to the commonly told stories and didn't go into it with any expectations. I thought Valerian was pretty, though I have to definitely agree on the casting. I actually really liked Kong: Skull Island, Alien Covenant and John Wick 2. I see what you're saying about them and agree somewhat but I still enjoyed them. Glad to hear King Arthur: Legend of the Sword was surprisingly good. Javier Bardem seemed like the most interesting aspect of the latest Pirates movie; I may watch it one day. That's a shame about John Wick II and Get Out and I totally agree about Sam Jackson in Skull Island. Can't remember if I watched it before or after the new year, but El Camino Christmas on Netflix was quite the disappointment. Thanks for all the reviews Alex! Jack Frost made me smile for some reason! LOL! I really don't want to see Dead Men Tell no Tales. But, as a rental, yes! Congrats to Truedessa! I am so happy for her! I agree she is an amazing poet!! Happy Thursday, Alex! Was it as nice there as it was here today? I wouldn't mind seeing King Arthur. Hope your day was productive and your evening pleasant. Lynn, sorry, I really dug the film. Toi, Jackson is such a great actor and he seemed wasted in that film. Birgit, you will really enjoy King Arthur then. Sandra, it was quite the change from just a couple days ago! Jack Frost sounds like it's good for some laughs. My husband enjoyed John Wick 2. He's into all that killing stuff. Me? Not so much. I agree with you about that John Wick flick. Seeing ONE person shot in the head would have sufficed, thankyouverymuch. Okay, I'm going to watch King Arthur now. I saw it's free On Demand and you made me want to see it. My son liked Kong. I would like to see King Arthur. I like C.H. but would like to see him in a role outside of SOA, the only thing I've seen him in. Hope the rain is no longer in your neck of the woods and that you're enjoying the sunshine. I haven't seen the fifth Pirates of the Caribbean movie because I don't want to be disappointed. I stopped at 4. But now that I've seen your review, perhaps I'll consider it if it's on Netflix. I can't think of a disappointing movie I've seen in the last year, but I didn't watch many new ones to be honest. Happy New Year, Alex! That's why I trust your movie reviews. All the movies you listed as bummers, I totally agree with. I saw them all and found them all lacking. During John Wick, I told my husband if they killed the dog again, I was walking out of the theater. Correction, I never saw Get Out. I never see horror in the theater-- I'd look stupid carrying in my security blanket. I enjoyed King Arthur. But I had a plot tweak-- it needed a romantic subplot. He was raised in a brothel-- he could have had a love interest there who gets killed later leaving him free for Guinevere. Planet 9? Oh yes, by golly! Samurai Cops, too? Keep the popcorn coming, I will not drink any liquid for hours before. Rankings! I'm too scared to even go see if I have any reviews at all!